"HEART MARK VIEWING":PROJECT 2 SUPPORT:WA WA PROJECT-Social Creative Platform for Opportunity-Know and support projects in eastern Japan ! 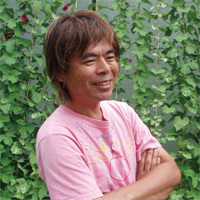 Katsuhiko Hibino gained popularity for a cross-disciplinary style which reflected the era of the 1980s. In recent years, through collaborative projects with community residents and by focusing on the power of the participants' senses, he has proposed new approaches for art to function in society. Great East Japan Earthquake Reconstruction Support Action "HEART MARK VIEWING"
A project which reaches beyond generations and communities to connect the hearts and shared feelings of people, and which aims to change the landscapes of disaster-hit areas with a "heart mark" used as a means of conveying people's sympathies. People who felt "Isn't there something I too can do?" after the occurrence of the disaster can here create a patchwork heart and join it together with other patchworks to form a tapestry which is then delivered to Tohoku and placed in disaster-struck areas. In addition, it is hoped that workshops held in areas of Tohoko encourage people, through the act of making a heart mark, to find some pleasure in making something with their own hands, or to return their "power to imagine a future", while also linking people's feelings to return the landscape to one full of hearts. 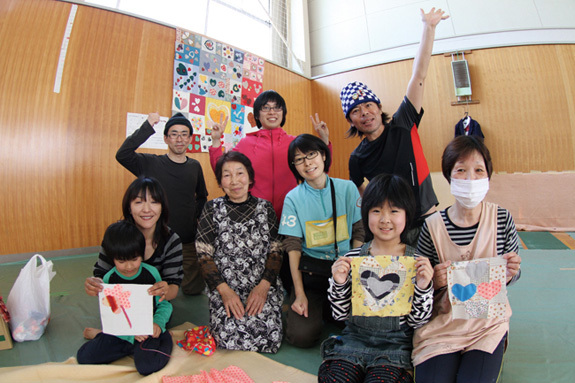 Heart Mark Workshops have been held regularly on weekends both at 3331 Arts Chiyoda and other venues across the country and once a month, the HEART MARK VIEWING tapestry is being delivered to areas in the Tohoku region. Using thread or glue, attach a heart mark cut out of cloth to a square piece of fabric. Once a number of these heart marks have been made and linked together, you can participate by sending them to "HEART MARK VIEWING" at 3331 Arts Chiyoda in Tokyo. For details, please refer to the "HEART MARK VIEWING"